I guess I didn’t think there was an interest in making fresh cranberry sauce. Boy, was I wrong. This recipe got thousands and thousands of views. Many people have been thrilled to find out how easy it is to make fresh cranberry sauce and I hope this year is no different. Add optional ingredients and then chill in refrigerator. This will keep in the refrigerator for about a week (if your family doesn’t try to eat it all). Have been making fresh cranberry sauce for years. I use just a little less than the 1cup of sugar, 1 cup of water and the cranberries. Nothing more! I like it because it can be made a couple of days in advance. I've been making it for years too. I add a cut up apple (with skin), cut up orange and a handful of raisins. The raisins add most of the sweetness cutting down the need for much sugar. I add about 3/4 cup water and maybe 1/2 cup sugar. I eat it on Thanksgiving and lots of other times, sometimes on cottage cheese!! I sub Splenda for sugar and add a bag of frozen berries, or sometimes a can of no sugar added peaches or mandarin oranges. The apricots sound like a great idea, I may try that this year! I also make cranberry sauce. Here in our area, Publix frequently does a buy one get one free promotion 2 weeks before Thanksgiving. I make a huge batch with orange peel, cinnamon and a tiny bit of sugar. I freeze in one cup portions and add to muffins all year long. I also use it as a filling between spice cake layers all year long. 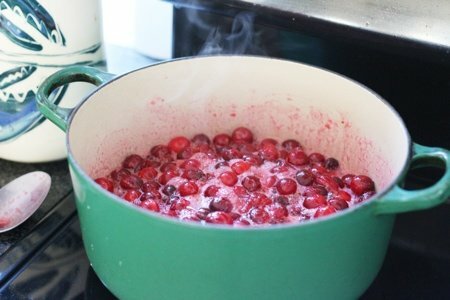 I've been making this cranberry sauce for over 10 years and love it. I was brought up on the canned cranberry sauce and when a friend of mine gave me her recipe, I never looked back :-) I make it every year for our Thanksgiving potluck at work and everyone loves it. I use OJ instead of water. A sugar bomb buy so good! -- been making it for years. Super easy. I love it. But you do have those family members that love the canned jelly-like cranberries, so I always serve those, too. I can personally vouch for Snack Girl's cranberry sauce. It is the best. I also have the unfair advantage of having been taught it -- along with some fun tweaks like subbing maple syrup for sugar -- when she and her family visited my home at Thanksgiving 10 or so years ago. It's not Thanksgiving without this sauce! I make it basically the same, ie:, ginger, cinnamon, etc., EXCEPT, I use maple syrup, (pure! ),instead of sugar, and cut back on the water. 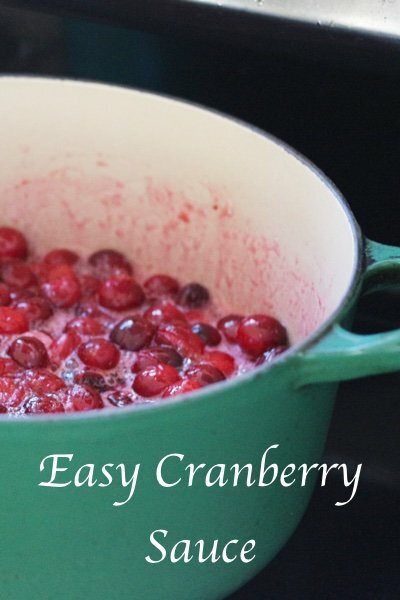 It is super easy-peasy to make awesome cranberry sauce. I respect Beth and others who prefer the canned, but I love the homemade. Leftover? No problem. It freezes well, so take advantage of the sales on fresh cranberries and have it in your freezer to use whenever. We like the sauce w/added cinnamon, ground nutmeg-which I find WAY tastier than ground-a cup of Zinfandel, cut up orange, n orange zest! From my tree. In the backyard. YUM! Lisa -- I have been making cranberry sauce for decades - l cup water, 1 cup sugar, 1 pound berries; boil for 10 minutes. I believe it is safe in the refrigerator for many, many weeks, no?? Mine has never 'gone bad,' I think due to the high acidity of the ingredients. I'm glad younger generations are making their own, too. It's awesome to see all the commenters who cut the sugar! Healthy and table sugar don't mix! I love, love, love fresh homemade cranberry sauce.. Made it one year with orange juice only and never looked back! I make it fresh, yearly, and hate it out of a can now. Some of these are great suggestions that I will try too! I use less sugar, prolly 2/3 cup, 1 cup water, and the rinsed berries. But I cook the snark out of it! I cook it on med/high heat until the berries burst, watching to not have it all over the stove; then I take it to a simmer for however long ... at least an hour. It will gel up then, and that's how I like it! It is wonderful that you can do it in advance ... like as far in advance as you want, and it does freeze wonderfully! Here's to all the cranberry purists! I chop a 12 oz bag of cranberries , add 2 chopped apples and 2 chopped oranges and then add 1 tablespoon of chopped candied ginger and a half dash of cinnamon. Mix this all and put in a covered bowl at least 4 hours before serving. I've never had left overs. I have been making this for years. The first time I took it to our office Thanksgiving potluck, everyone fell in love with it and requests it every year. So easy to make and so very good.